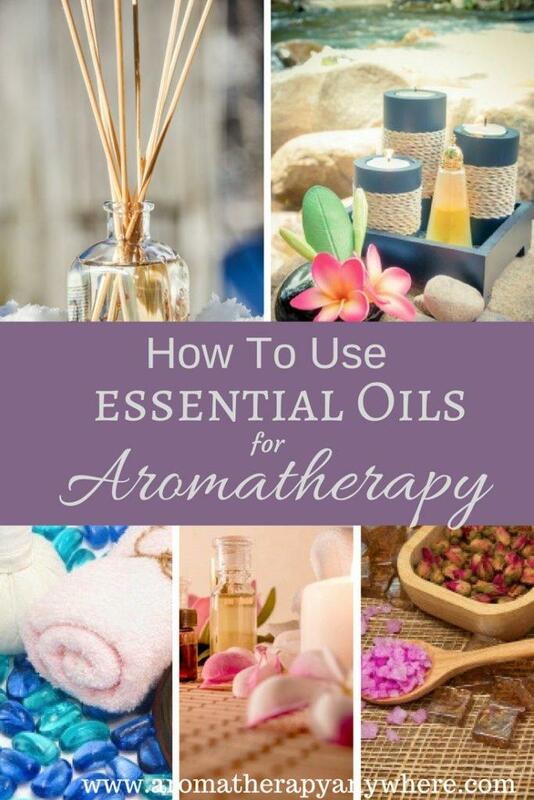 When you are just getting started, it is really important to first take some time to learn all you can about how to use essential oils for aromatherapy the right way. Every essential oil has its own distinctive properties and uses. You can get the benefits of some essential oils through aromatherapy whereas others are most effective when applied topically. Just as there are several different methods that are used to extract essential oils, there as many methods to apply and use essential oils. The variety of chemical compounds in each essential oil means that their benefits and applications also vary hugely across the board. If you do not learn how to use essential oils correctly, you could experience an adverse reaction. 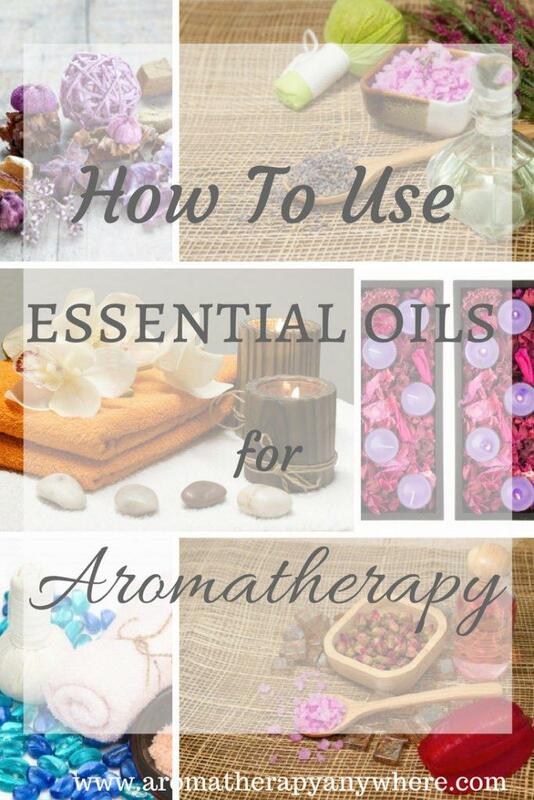 Below are a few of these methods that you can use to administer essential oils therapeutically. Each method has its own pros and cons and even its own level of convenience. You will have to choose one that suits you best. The three most common ways to use essential oils are by inhalation, topical application, and ingestion. Cautionary Note 1: Only very few essential oils can be ingested and you must exercise extreme caution when doing this. Never ingest any essential oil without first consulting with a doctor or a qualified aromatherapist. Cautionary Note 2: The methods mentioned below are intended as guidelines only. It is important to remember that you must pay special attention to all safety notices applicable for each specific essential oil that you choose. Commonly known as “aromatherapy”, this essential oil application typically supports the respiratory system and minor sore throats and cold. 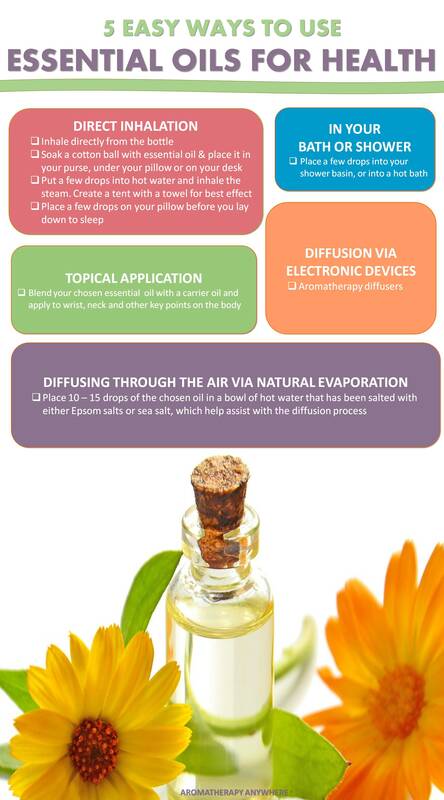 Steam inhalation is really one of the simplest ways to use aromatherapy. Add 3 to 7 drops of essential oil into a bowl of boiling water. Drape a towel over your head so that it forms a tent that prevents the steam from escaping. Inhale the scented vapors through your nose. The towel captures the vapors, making the technique even more effective. Steam inhalation helps to open up the nasal pathways and enhance respiratory function. Using an electric steam inhaler makes it easier to keep the water heated continuously for a longer period of time, which increases the effectiveness of this technique. For direct inhalation, put a few drops of essential oil on your palm, place your palm close to your face and inhale directly. You can also place a few drops on a tissue or handkerchief and inhale from it. An easy way to use essential oils for aromatherapy while you are sleeping it by placing a few drops of your selected essential oil on your pillow. When you lay your head on the pillow you will automatically inhale the aromas as you breathe. Certain oils such as lavender and chamomile have a relaxing effect and can help you sleep more deeply and wake up refreshed and energized. Diffusers are specially designed devices that disperse a super fine mist of essential oil vapors into the air. You inhale these vapors naturally as you breathe in. Using an essential oil diffuser is simple. You put a few drops of the essential oil into the device and turn it on. Remember there is a wide range of diffuser models available, and each uses a specific delivery method. Before buying an essential oil diffuser, take a minute to read a few diffuser reviews about the different types of devices that are available, how they work, the pros and cons of each, how to use them, and how it will help you. Using diffusers will help improve your energy levels, increase alertness, improve your mood, boost sleep quality and fill your home, office or car with healing air-freshening aromas. Prefer to read diffuser reviews before buying? Adding 5 to 12 drops of essential oils to your bath water can turn an ordinary bath into a super-relaxing routine that provides you with a number of health benefits. Depending on the essential oil that you add to your bath water, this method is great for reducing stress and anxiety, as well as alleviating muscular tension and pain. To get the maximum benefits of the essential oil in your bath, first, mix a few drops of the oil with Epsom salts. Drop this mixture into the bathtub. Essential oils mix faster and more thoroughly into hot water when mixed with Epsom Salts first. Avoid adding any other soap or bath salts into the water or they could react with the essential oil, and reduce its healing benefits. Other health benefits of adding essential oils to your bath include increased local circulation, detoxification, and improved skin health. Not everyone has the luxury of time to sink into a bath every day. Fortunately, you can still enjoy the benefits of essential oils even on those days that you when you have just enough time for a quick shower. Simply plug your drain, add a few drops of oil to the floor of your shower and turn the shower on. The hot water will create a therapeutic steam that will envelop your whole body. Direct application of many essential oils works like a sponge. Your skin is a large organ sopping up oils or chemicals that you apply to your skin. When applying topically, you can either massage the oil into the skin or simply dab on the skin for therapeutic results. Topical application is the preferred method when you want to clear up an ailment on the skin or in the underlying muscle tissue. Some essential oils are potent and should be combined with a carrier oil before applying onto your skin. This is always recommended for topical use. Carrier oils are usually cold-pressed oils that are used to dilute the potency of pure essential oils. Some of the more popular carrier oils for essential oils include avocado oil, fractionated coconut oil, apricot kernel oil, jojoba oil, olive oil, grape seed oil, sunflower, oil and sweet almond oil. Know more about carrier oils for essential oils. Carrier oils do not evaporate as quickly as essential oils do but they do get rancid if kept for too long so you have to be careful. Topical applications of essential oils are typically used to boost your body’s defenses against rash or muscle pain, but you should always test for allergic reaction before applying. This is done by applying a dab of oil to a small area before expanding the application to larger areas of the skin. To test for allergens, place a drop or two on your inner forearm. If a rash develops within 12 to 24 hours, then you may be allergic. In addition, phototoxicity – sun exposure resulting in an exacerbated burn – may be an issue when citrus oils are applied topically and if you spend time in direct sunlight. You must proceed with caution when applying essential oils using this method. By itself, getting a massage can be immensely relaxing and offers you numerous health benefits primarily because it helps to reduce stress. When you mix massage oil with a few drops of essential oils, you will experience even more benefits. Massages with essential oils help boost your immune system, relax your nervous system, treat headaches and migraines and offer pain relief. If you want to rejuvenate your skin, you can simply buy unscented body lotions and facial creams and mix them with essential oils. Mixing them together will improve your skin tone, slow down the aging of the skin, reduce the visibility of scars, increase local circulation and encourage hydration of the skin. The benefits will depend on the type and concentration of the essential oil that you choose. When using this method, proceed with caution. Direct ingestion of essential oils must be monitored and applied in small doses that are diluted in a tablespoon or more of any carrier oil – olive oil, for example. If you are unsure of dosage amounts, make a tea with the relevant herb instead. Although the effects of this diluted use may be weaker, this application is a far safer alternative than an overdose of essential oils. Use only 100% pure therapeutic grade essential oils, from reputable brands. Therapeutic grade oils are your best option, unlike lower quality products that use fillers that diminish the therapeutic value that is in pure oils. As far as quality goes, due diligence and careful research pay off. Essential oils may be produced as a blend of several pure oils. Blending oils is a great way to gain various therapeutic benefits from a single oil. For instance, you can use a blend of cinnamon, clove, rosemary, and eucalyptus to boost the immune system to treat colds, viruses, and flu. You can make your own blends, or buy ready-made blends that target specific needs. It is absolutely crucial to understand proper methods for applying the blend as combining oils increasing the possibility of triggering adverse reactions. Learning how to use essential oils for aromatherapy while traveling changed everything for me while I was still working as an in-flight stewardess. I did not have to deal with dreaded jet lag or waste a whole day adjusting to the time difference. My body adjusted quickly and I felt energized and ready to jump out of bed all ready to explore new destinations, no matter what the time difference. Once you learn how to use essential oils for aromatherapy while traveling, you will see the difference it will make. The joy of not being dragged down by jet lag can be exhilarating! 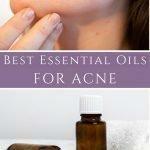 Essential oils are highly concentrated extracts from plants and they are very potent. To get a better idea of the potency of these oils – 1 drop of peppermint oil is found to have the same strength as 28 cups of peppermint tea. That’s a lot! Storing your essential oils correctly is the key to keeping them as fresh as possible and extending their shelf life and their efficacy. Essentials oils are expensive and it would be a shame to let them go bad only because they were not stored correctly. Learning how to store essential oils will help you get the maximum benefits of your investment. Essential oils are best stored in dark amber glass bottles or cobalt blue bottle. Using these dark glass bottles is important to protect them from bright light, which breaks down the oils and renders them useless. For this reason, they also need to be stored away from direct sunlight, which can ruin the oil very quickly. Only use glass bottles to store essential oils. Rubber or plastic reacts with the oils and alters their chemical composition and their efficacy. Also avoid storing pure, undiluted essential oils in bottles with rubber dropper tops. The rubber will turn to mush and ruin the oil. Always store all essential oils in a place in a cool dry place that never gets overheated or overcooled. Some oils store well in the refrigerator but some will harden. This does not ruin them, but you’ll have to set them out to liquefy again to use and you may not like that if you want to use them right away. 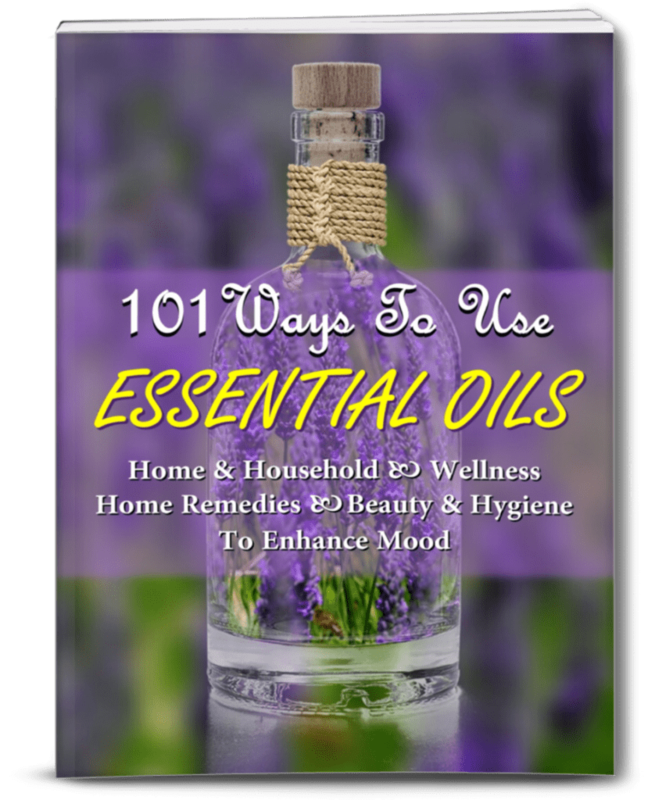 Never use essential oils in their hardened state as you are more likely to use too much. The other key to storing essential oils and making them last longer is to only buy high quality, pure essential oil. You’ll pay more upfront but they will last a lot longer due to having only one ingredient instead of other fillers being added. Have you used essential oils for aromatherapy? Did you try using a blend of essential oils or did you use just one type of oil? Share your experiences in the comments below so that we may also take away a few lessons from them. If there’s one thing I’ve learned about using essential oils for aromatherapy is that there is always more to learn. It’s only when you know the what, where, and how to use essential oils correctly that you will be able to get the maximum health benefits of aromatherapy.